Visitors arriving at Lyon, France by boat are welcomed to the city by a whimsical, eye-catching, larger-than-life Flower Tree sculpture that sits close to the bank of the Rhone. Pedestrians can easily sight the Flower Tree, too, while walking on the eastern side of Place Bellecour, the city’s immense central square. The bouquet of 85 flowers is 6-meters (almost 20-foot) tall and is actually positioned on a smaller square, called Place Antonin Poncet, beside fountains that offer a cool mist in the summer. In winter or when clouds cover the city, the sculpture offers an expected burst of color. Created by a Korean pop artist Choi Jeong Hwa, the Flower Tree was first created for the Lyon Biennial Contemporary Art Festival (held in years ending with odd numbers) in 2003 but has been sitting at its present location since 2007 when residents of the city decided to make it a permanent fixture. The artist, who lives and works in Seoul, uses everyday materials to create public art that seeks to engage participation. The Lyon sculpture is made of stainless steel with a durable polyester resin coating. A “big sister” (25-meter) Flower Tree sculpture by the same artist is also on display in Shanghai. Choi Jeong Hwa’s installations invite the audience to experience these objects and materials in a new way. Viewers can touch, walk through and around the installations, creating movement through mobile, hanging pieces. Choi Jeong Hwa challenges the status and reverence of artworks in galleries and museums by creating artworks from non traditional materials as installations, away from these formal institutions, that can be touched and experienced by an audience. Now, a decade after it’s creation, you still can’t help but look at the Flower Tree and smile. In a city known for the ways in which it both preserves and reinterprets the classics, Lyon seems to be a perfect home for this spectacular piece of public art. What is a Lyonnaise bouchon? My kind of art!! Beautiful! It’s easy to fall in love with a piece of public art that shows up in an unexpected place, isn’t it? 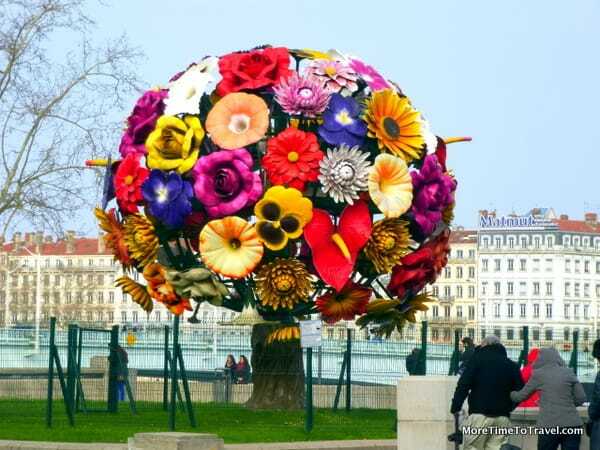 The flower sculpture certainly provides a colorful and happy welcome to visitors to Lyon. It’s such a happy feeling and colorful, what a nice way to greet tourists! I’ve never heard of this before. It sort of reminds me of Chihuly, but of course it is quite different–I think it’s the colors and the subject of flowers. I’m a fan of Chihuly, too, Carole. Got to see his work exhibited in the Desert Botanical Gardens in Phoenix. It was a fantastic! Don’t you just love, Europe! They come up with the most amazing art. I remember something similar to this in Spain that inspired me. This is such a wonderful idea — flowers that “bloom” all year round. A day brightener for sure. We ran into a string of cloudy days and the flowers always offer local color! The flower sculpture is impressive. Beautiful, especially with the fountains nearby. I love coming across treasures such as this when we travel. Good find! I’m so glad you found this amazing work of art. What an explosion of color and I’m sure it brings smiles to visitors even on a cloudy day. I absolutely love flowers and this sculpture is awesome! Now I have another reason to visit another area of France besides just Paris! It’s only a little two hours from Paris on the high-speed train. Well worth a visit! A quirky but colorful piece of public art for sure! That does make me smile! My favorite kind of art: the kind I can look at, appreciate and actually know what it is. Your post makes me want to return to Lyon, a place we spent far too little time, too long ago. What a fun sculpture installation. Lyon is a wonderful city, which such charming and welcoming people. It is also one of the great gastronomic centres of France, so is definitely worth a visit. It makes a convenient last stop on a trip through a France as the TGV can drop you directly at Charles de Gaulle for the trip home. That’s exactly what we did. We took the high speed train directly from Lyon to Charles de Gaulle when we were ready to return home! The tree is nice, but the surroundings are even nicer. Actually, the core/s of Lyon is/are full of nice surprises. I arrived to this place via the metro/subway and it was one of those smaller mind blowing experiences since the place where I arrived from was a quite usual looking business district. It’s easy to arrive to Lyon via air, water or land. It’s quite easy to make day trips in the area as well, if perhaps a bit expensive. The place was very child and senior friendly. Thanks for stopping by More Time To Travel. I just love the flower tree! What a beautiful piece of art! Beautiful art, I love it!